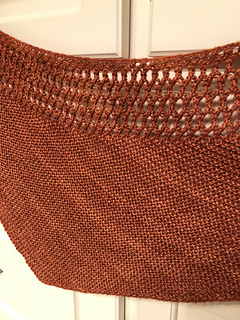 By featuring double yarn overs in an offset pattern I was able to create a pattern that, after the set up, you simply repeat the same two rows over and over again. Because of this feature you can use up nearly every gram of your available yarn. 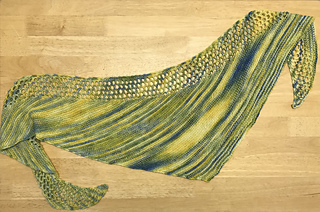 And as with the previous shawl, should you want to knit this in a different yarn weight, you will simply need to adjust your needle size. 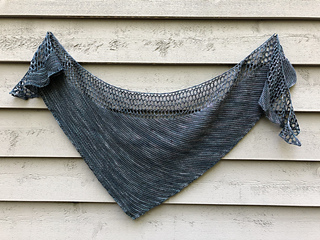 Because I was designing this in the middle of the Summer, I chose the amazing 50% Superwash Merino/50% Tussah Silk blend found in Silken from Anzula in the color Lapis. 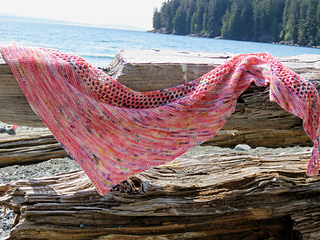 With only one skein I was able to create a perfect small Summer shawl with amazing drape and airy lace. An added bonus of this particular lace and garter combination is that it is beautiful from both sides, so there really isn’t a wrong side. This pattern has been tech edited and tested. Pattern can be worked entirely from written or from charts. If you’d like to see this pattern in action check out the pattern tour video on my YouTube channel Watch Barbara Knit.